* Support batch conversion and GPU Acceleration. 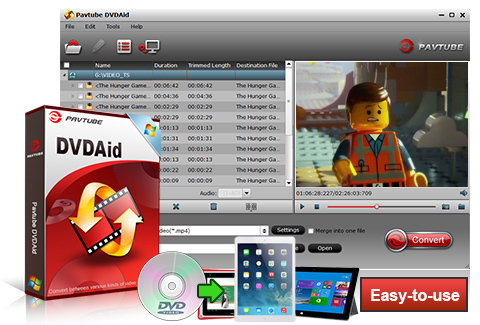 Convert DVD sources to various formats both in SD and HD quality. The output formats can find their applications in devices such as Apple series, smart phones, tablets, game consoles, media players, etc. Backup your DVD disc with all information including audio streams, subtitle tracks, and extras preserved. Backup the main movie in your DVD disc without those annoying previews, warnings and promotional clips. There is a preview window on the main interface of DVDAid which allows you to take a preview of your DVD movie before conversion. The thoughtful built-in video editor allows you to be a video maker by trimming, cropping, merging, splitting, adding subtitles, adjusting video effect, etc. You can create your very own video for various purposes. With technology of NVIDIA CUDA and AMD APP, you’re allowed to accelerate conversion by using H.264 codec. You’re allowed to adjust codec, bit rate, frame rate and other settings for your DVD movie to better suit your device and better entertain yourself. Select your target subtitle and audio track from your DVD discs for better entertainment. How to transfer DVD movies on Galaxy S6/S6 Edge?